Summer is over and my day job, flying an airliner, has eased off for the Winter giving me some time at last to write this blog and work on my projects! Exclusively Analogue has always specialised in making limited quantity custom built synthesizers and “The Aviator” was a perfect example of this. In total only 35 were actually produced back in the1990s so a rare beast and apparently much sought after. I recently had one of the earliest examples back for refurbishment and I have included some photographs of this unit so you can see a bit of what’s inside. The first picture shows how the very early front panel looked followed by a picture of what sits behind the front panel. 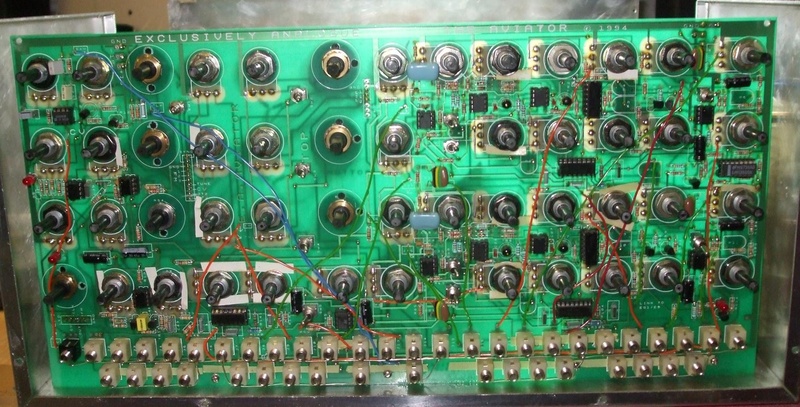 Quite complex and it took a lot of building especially when you add the 4 VCO boards, 24dB Low Pass Filter Board, and Power Supply. Later “Aviators” had a slightly redesigned front panel and a ‘special’ rear panel as shown below. The first of these will have a Black front panel and include a “Custom Built for ***********” text in the top left hand corner. An example of the panel artwork is below. I intend using the Solid Aluminium knobs from the Emu Modular system with this panel and once it’s built up I will post some pictures for you. I plan to use up my stock and build a further 3 “Custom Built” Black Aviators and perhaps another 5 Original Silver and Blue ones if I can get the extra CEM ICs that I will need. These will definitely be the “Last of the Few” and if nothing else, could prove to be a sound investment considering how other old analogue synthesizers have risen in price. If you would like to be an owner of one of “The Last of The Few” Aviators then get in touch. It will be on a first come first served basis. 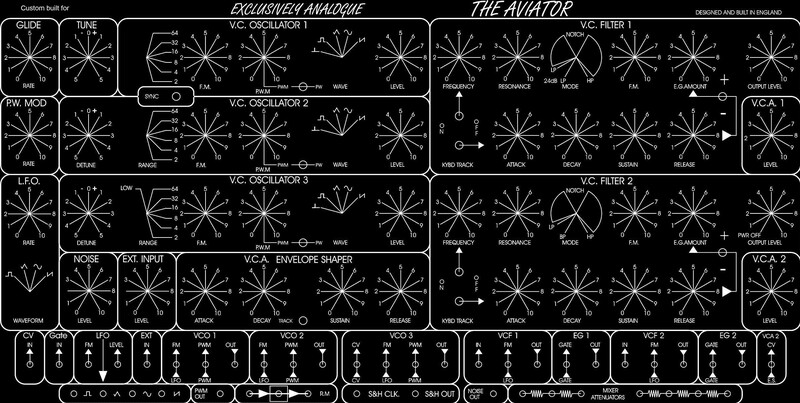 It is unlikely that I will ever make a Mark 2 “Aviator” simply because they are very time consuming to make. I am considering producing a scaled down 2VCO “Mini Aviator” version using more readily available components and a less complex design. It will still have a unique and Magical sound, mainly due to the Filters, be in a 19” Rack format and still have some jack sockets for ‘patchability’ just like it’s big brother. These won’t be available until Summer 2013 at the earliest.